The Two of Cups from the Rider/Waite/Smith deck is a card of relationships or partnerships. It shows a man and woman pledging cups to one another under a red, winged lion’s head and a caduceus (a symbol of the healing power of relationships). While this card often represents a commitment between lovers, it can also represent a partnership of any type. This partnership is based on mutual ideals and principles. In other words, it is a commitment that enhances and encourages positive growth in each partner. 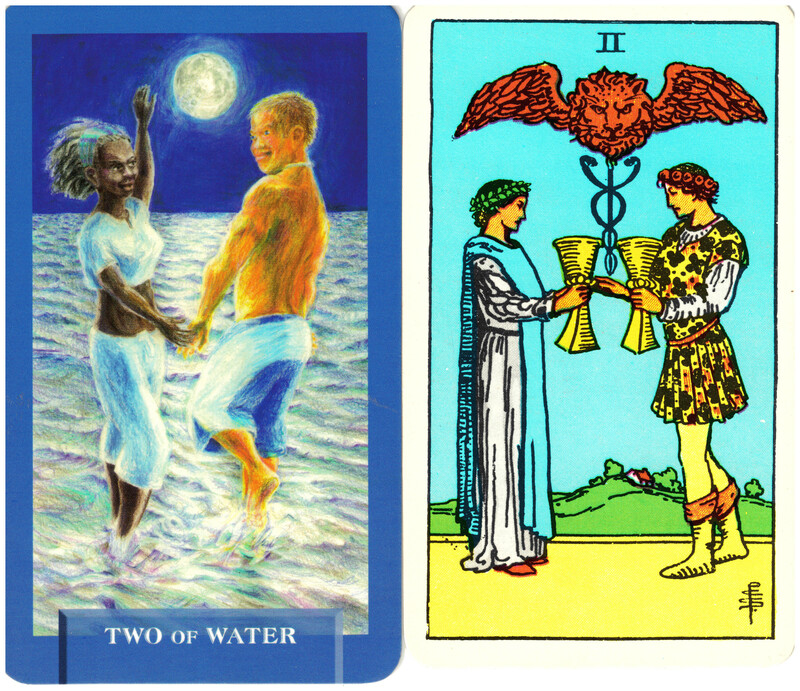 The Two of Water from Today’s Journey Tarot depicts a man and woman wading in the ocean under a full moon. They hold hands and gaze into each other’s eyes as the moon illuminates their relationship.